Mr. Musleh joined Methfessel & Werbel in January 2015 and works in the subrogation department. 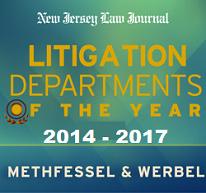 He transitioned from a firm in Fair Lawn, New Jersey where he specialized in the representation of management in school law, employment law, and labor relations. Following law school, Mr. Musleh worked as an associate at MTBC, a publicly traded healthcare information technology provider, and completed a judicial clerkship with the Honorable Amy C. O’Connor in the Appellate Division. Mr. Musleh received his undergraduate education from Rutgers University. He thereafter attended Rutgers University School of Law in Camden. While in law school he spent a semester as a judicial intern for Chief Justice Stuart Rabner in the New Jersey Supreme Court, a semester at the New York County District Attorney’s Office in New York, and two semesters at New Jersey Legal Services. Mr. Musleh also served as Managing Research Editor of the Rutgers Journal of Law & Public Policy. Mr. Musleh works under the direction of I. Blakely Johnstone, III and currently represents insurance carriers, insureds, and self-insureds in subrogation actions of all types.